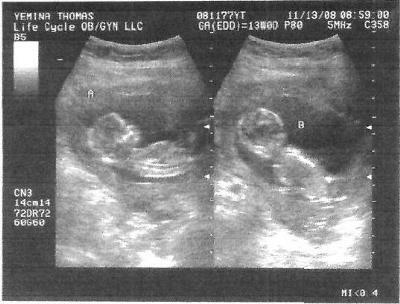 I was fourteen weeks pregnant at this ultrasound. This is when we found out that one baby was really two. I feel extremely blessed that God has trusted me with a double blessing. They are fraternal. A girl and a boy and they are 13 months old now. You have so many wonderful days ahead, enjoy! I just had my first ultrasound at 14 weeks and discovered two as well!!! Congrats, its a shock for sure but definitely a blessing! are they fraternal or identical?